Selfie. If the term wasn’t already part of our daily pop culture vernacular, Ellen DeGeneres took it to new heights when she famously took a selfie during the 2014 Academy Awards telecast and posted it on Twitter which then created a viral sensation so huge it broke down the site! So it’s no surprise that Hollywood has picked up on the latest craze and turned it into a recently green-lighted sit-com. 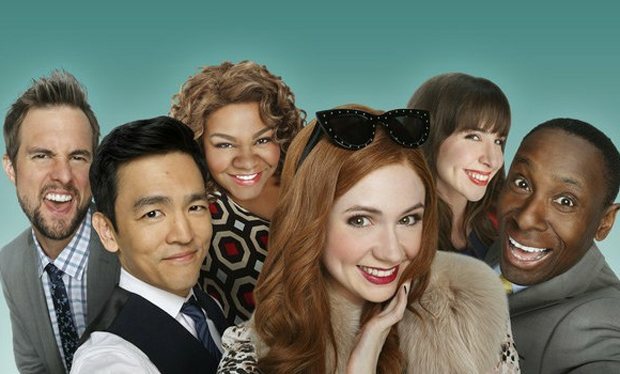 Coming this fall, get ready for ABC’s Selfie described as a modern-day take on My Fair Lady and starring former Doctor Who companion Karen Gillan as ”Instafamous Eliza Dooley” who has 263,000 followers (just like The Anglophile Channel) who hang on to her every post, tweet and…selfie. Yep, it’s the sign of our times. Coming this fall to ABC, Selfie, starring Karen Gillan. “Selfie” tells the story of a self-obsessed 20-something woman named Eliza Dooley (Gillan) who is more concerned with “likes” than being liked. After suffering a public and humiliating breakup, she becomes the subject of a viral video and suddenly has more social media “followers” than she ever imagined — but for all the wrong reasons. She then enlists the help of a marketing expert (played by Star Trek’s John Cho) at her company to help repair her tarnished image. Selfie actually echos similar themes incorporated into the recent web-series phenom, The Lizzie Bennet Diaries, an updated re-telling of Jane Austen’s Pride and Prejudice as told in 5-minute Vlogs by a young 20-something Lizzie Bennet. Series creators Hank Green and Bernie Su went on to brilliantly incorporate social media interaction between his characters and the fans. Again, capitalizing on this generation’s daily dependence on the Internet. In fact, I wonder if Green and Su ever pitched LBD as a network series to anyone? It wouldn’t be the first time a network was “inspired” to create their own show after hearing a clever pitch (cough: Bravo). The series also stars David Harewood (Homeland), Tim Peper(Conviction), Da’Vine Joy Randolph (Ghost the Musical) and Allyn Rachel(Million Dollar Arm). Let the selfie phenom begin! …or continue. This entry was posted in Home Page Posts, Lady Anglophile Reviews & Other Bits and Bobs and tagged ABC, Academy Awards, Allyn Rachel, Da'Vine Joy Randolph, David Harewood, Doctor Who, Ellen, Homeland, Jane Austen, Karen Gillan, Lizzie Bennet Diaries, My Fair Lady, Pride and Prejudice, Selfie, Tim Peper, Twitter. Bookmark the permalink.